California State Board of Food and Agriculture President Craig McNamara. 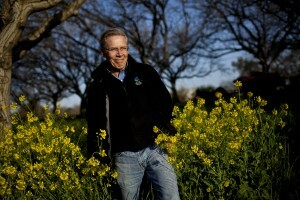 Craig McNamara embodies agricultural leadership in California. He has farmed a 450-acre organic walnut orchard in Winters, California for the past 35 years. He’s been an innovator in implementing conservation practices on his land that both enhance wildlife and benefit his farming operation. He’s also the president of the California State Board of Food and Agriculture, and an influential sustainable agriculture educator. I’ve known Craig for about 10 years and have had the honor of serving with him on the State Board for the last two. I spoke with him about how he integrates farming with ecology and his plan for dealing with potential El Niño rains. Tell us about the interventions you’ve made on your acreage to protect wildlife. Do you remember when Earl Butz was Secretary of Agriculture under Nixon? His motto was to farm “from fencepost to fencepost” — removing biodiversity from our farms, which was a big mistake. Over the past 20 years, we have been planting hedgerows on our land, which is the managed planting of California native grasses, plants, shrubs and trees. This ensures that something will always be in bloom from January to December so we have habitat for native pollinators, which are so critical to our global well-being in terms of food production. The lady beetles, butterflies, and native bees, which are our natural predators, require protein and energy to control pest populations in our orchard. If you don’t have a plant in bloom, they can’t survive. You and your wife Julie have also done a lot to educate folks about hedgerows. Twenty years ago we founded the Center for Land-Based Learning to teach high school students about sustainable agriculture and natural resource conservation. We engage students from Yuba City to Bakersfield in activities like restoration and planting hedgerows. As we plant new acreage of walnuts, we often plant several acres in a hedgerow so that the inner part of the farm will be connected to our watershed of Putah Creek. This makes a flyway and corridor for animals and insects and birds that wouldn’t have had that habitat. We also collaborate with UC Davis and UC Berkeley on technical research projects studying the populations of bees, bats, birds, owls, and rodents on our land. So we know for sure that these measures have contributed to conservation. What have you done with sustainable watershed management? We’re fortunate that our middle son, Sean, has come back to the farm to assist us. He’s taking on the creek restoration project and implementing a whole new mulching and composting regime for us. At harvest time, we remove the high-tannin hulls from the walnuts, and usually farmers just mound them up and they become a toxic mess because of the concentrated tannins, which is bad for water quality. But this year we will be composting the hulls with shredded walnut trees from old orchards. And then you’ll use the compost? We need about 1,000 tons of compost a year to feed the ground and fertilize it. We don’t use any synthetic fertilizers, so we depend on compost and cover crops, which are nitrogen-fixing plants. How has the drought affected you? We are fortunate to be in a watershed fed from freshwater in Lake Berryessa, but everyone in our watershed is unsustainably pumping from the aquifer, so we need rain. Now, we’re out preparing for the possible El Niño. We want to be able to capture that rainfall on the farm, pump it out from our creek and flood the orchard in order to recharge the aquifer. If we let the creek carry it away, it would quickly go out into the (San Francisco) Bay and the ocean. Our retention ponds that have been dry for years could store the water and it will percolate down. The beauty is that farmers across California are much more aware of these water-banking techniques than ever before and are prepared to do that if we get the rain. You’ve been involved as an advisor to the last three governors as a member and now president of the state board. How has that experience affected your farming operations and your interaction with the agriculture community in California? Serving on the California State Board of Food and Agriculture has been the single most rewarding agriculture experience of my career. The leadership provided by Secretary (Karen) Ross and Governor (Jerry) Brown and my fellow board members has catapulted me into the most critical issues of our time: climate change and drought. I have been able to apply the experiences and models that I have gained at the Board level directly into pro-active farming practices on our farm. The connections that this experience has provided me extend across California agriculture and indeed all the way to Washington, D.C.
Craig McNamara is president of the California State Board of Food and Agriculture. Eric Holst is a State Board member and associate vice president of the Environmental Defense Fund’s working lands program.